Roger J. Chouinard joined QuadReal as Chief Legal Officer & Corporate Secretary in June 2017. He is responsible for all transactional, operational and corporate legal matters, including board governance and regulatory compliance. Roger has deep expertise in business and corporate finance law, real estate acquisitions and joint ventures, complex transactions and structures in Canada and internationally, as well as compliance oversight. Most recently, he served as General Counsel and Corporate Secretary for First Capital Realty, one of Canada’s largest owners, developers and managers of grocery-anchored, retail-focused urban properties. Previously, he was a Partner with McCarthy Tétrault LLP, a leading Canadian business law and litigation firm. 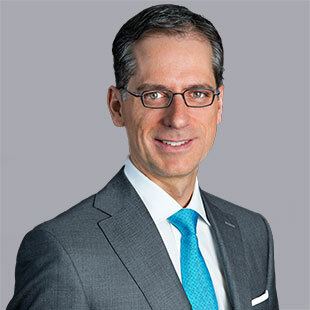 Roger holds a Bachelor of Commerce from McGill University, a Bachelor of Laws in Civil Law from Université Laval, a Bachelor of Laws in Common Law from the University of Victoria, and a Master of Laws in Securities Law from Osgoode Hall Law School (York University). Roger feels energized to be part of the team shaping QuadReal into a world-class real estate investor and manager that is fueled by the passion, engagement and integrity of its people.